Exceedingly wide range of all sorts of “gadgets” and “widgets” for iPod, of course, is not limited only to what you can use on the go or just drag along unless the time is right. In this installation of “iPod ecosystem”, we are going to cover those accessories for iPod players, that can be used at our, or, if it comes to the pinch, at your workplace. It is easy to make a guess that these accessories are at least the same in numbers, but they have a sole, yet utterly important advantage over the pocketable contemporaries: their creators don’t have to bother about scaling them down to the limit. And naturally the primary motif driving all developers in this area is audio playback, which makes for a wide choice of gadgets, ranging from various cables to wireless audio transmitters and of course all kinds of audio systems, which the long-suffering iPod fits into in a dozen of different ways. While getting any of the Apple-branded gadgets is a cinch, accessories by other companies, even if large and known, are not well-distributed in Russia and thus quite hard to get hands on. Though, the year of 2007 should be the very decisive in this respect, especially if sales of iPod players will grow up at the same pace as in 2006. Then the range of widgets available on the shelves of stores, and which retails can gain from will steadily increase up to the adequate level. After reading this article, don’t hasten to blame us in being way too loyal to Apple’s products, especially against the backdrop of abundance of third-party makers, and here is the reason why. The fact of the matter is that the devices created by the company’s engineers for use with their uber-popular offspring, act as a sort of benchmark, that other vendors, and hence authors of overviews, try to live up to. That’s why it wouldn’t be the wisest move to praise third-party solutions to the skies without taking a look at the original accessories. Fully in line with this guideline, the centerpieces of this very article will be, undoubtedly crying out for a pinch of attention, such gadgets as Apple AV Connection Kit and Apple TV, officially introduces literally a couple of days ago. As for the first device, we will present you with a comprehensive field report, and as regards Apple TV, due to its being temporarily unavailable until we have some first sample units here in Russia, it will be honored with a handful of subjective notes in the form of the author’s opinion. Even in light of the article’s subject, the title of this chapter looks quite odd. It would seem what one could do with the player at home, saving for uploading new tracks and recharging the battery? Of course, there are some people keen on using the player at home, but, in practice, this group turns out to be totally outnumbered. However, if we think of iPod in a slightly different way, then its usage at home won’t feel like something out of this word. You judge: a 30, 60 or even 80 Gb hard drive can carry loads of media content which not always perfectly fits in the tiny player’s display. And sharing the fun stored on the player with friends and relatives is something you might want to do. At that “sharing” not in the sense the copyright zealots truly hate, but rather watching clips, photos and listening to music in a circle of friends. This is where all those “widgets”, designed by the engineers of the companies dealing with iPod-accessories, come to the rescue. 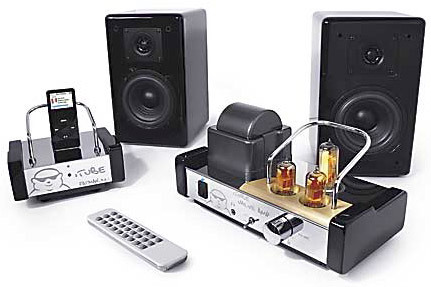 With their help, playing back video on a telly with an iPod as a source, and sound via a stand-alone audio system or TV-speakers, is a cinch. Showing off to each and everyone the selection of your New Year photos can be done exactly in the same way. Over and above, there is another interesting application: iPod can turn into a relatively cheap slide-show generator for presentations or a shop, as all you have to do is upload the snaps and link up the player with a big screen or a projector. 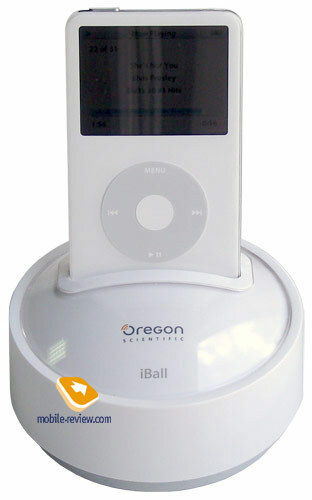 Since iPod is a music player in the first place, home-accessories employ mainly this fact alone. A lot of makers release special audio systems ranging from a la “place it on your table and let it buzz” to real multi-channel monsters. 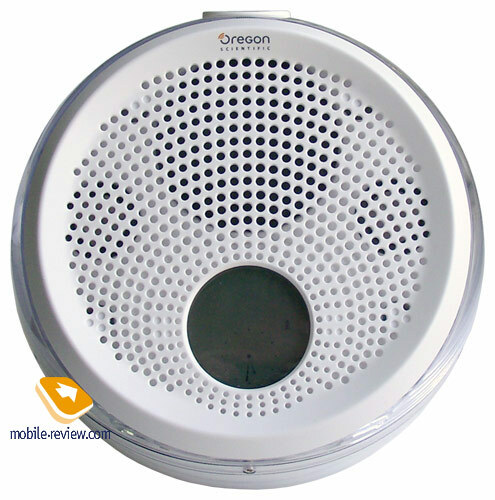 It’s remarkable that accessories covered in the first “on-the-go” installment of the article, are produced by relatively small companies, while accessories for usage at home are delivered mainly by such grandees as JBL, Logitech or Bose. 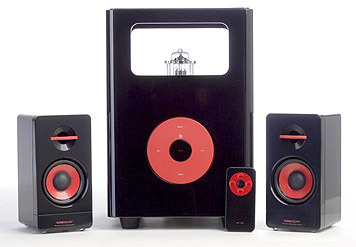 Undoubtedly, these are audio systems for the most part. 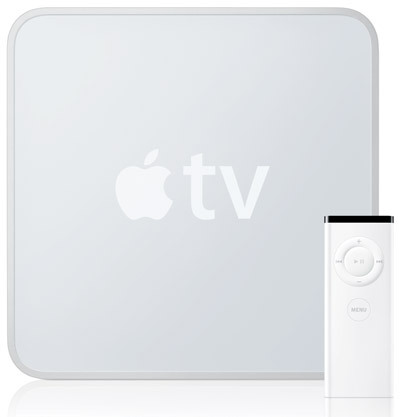 Many companies, including Apple itself, tend to experiment with various widgets, expanding video merits of iPod – for example by allowing you to watch videos on the TV screen. Over at Apple they, however, took a few steps forward and came up with a stand-alone device for watching on the TV video clips stored on your PC, which got Apple TV name – data there is transferred over the air, while the maximum number of supported PC reaches 5. As soon as these truly intriguing devices make it to the Russian market, we will release an in-depth review. 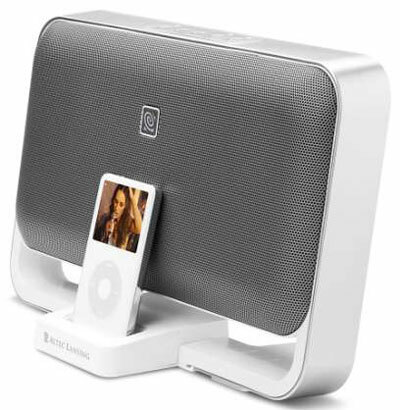 But going back to the matters at hand, namely home-accessories for iPod, they can be divided into two categories – audio and audio/video. 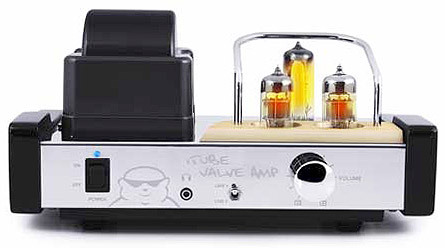 The former serve only for audio playback and include various cables, wireless systems for beaming audio signal and even such exotica as tube amplifiers armed with the proprietary connector. The latter camp features more flexible widgets designed for usage of everything the player has to offer – there are also some cables, yet wireless devices are non-existent in this category, instead we get various cradles, often coming equipped with extra abilities. 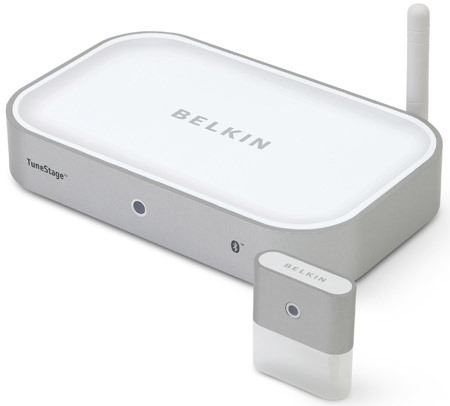 The benchmark in this segment is Universal Dock by Apple, which comes boxed with AV Connection Kit or retails as a separate unit. 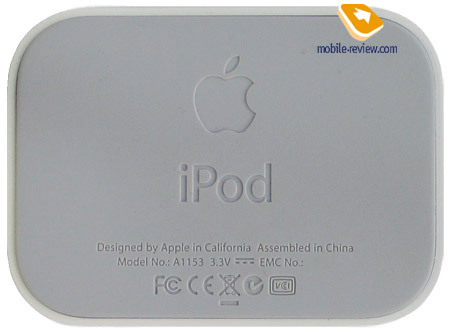 The offbeat accessories, for the most part, haven’t arrived in our market yet, thus portraying how handy iPod may be at home we will reserve for the second part of this article, where we are having a glimpse of a very fetching Apple AV Connection Kit. And now I think a couple of images of the some interesting gadgets making for integration of the player with the home stereo/video system, won’t do any harm. An interesting kit that we have managed to get our hands on is boxed in a bulky stylish black box, which comes as a kind of surprise, to be honest. Anyhow, we have never paid much attention to the wrapping, and aren’t going to cheat on this rule now. Inside the box are the constituents of the kit themselves, which are three important details, each of them is retailed as a stand-alone unit as well and sets the bar in the own area, due to being manufactured by Apple itself. 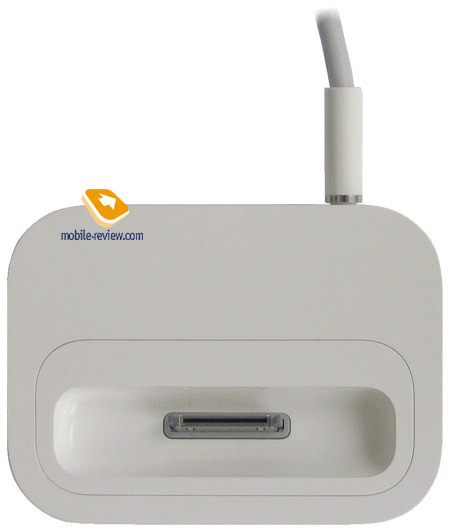 Apple AV Connection Kit includes Universal Dock cradle, Apple Remote and iPod AV Cable. In practice the cable is the most important part of the kit, as without it, you won’t have much success in linking up Universal Dock with anything but the power network. 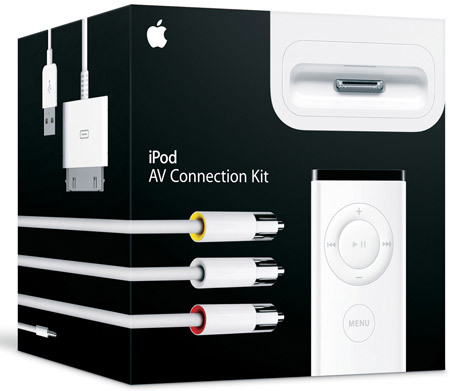 Apart from that the AV Connection Kit comes included with five adapters for various iPod models (up-to-date 5G and Nano don’t need them) and a power adapter, that costs some heavy coins if bought separately. Lyrics aside, we are moving on to the kit itself, specifically, its smallest and less sophisticated detail – the remote. 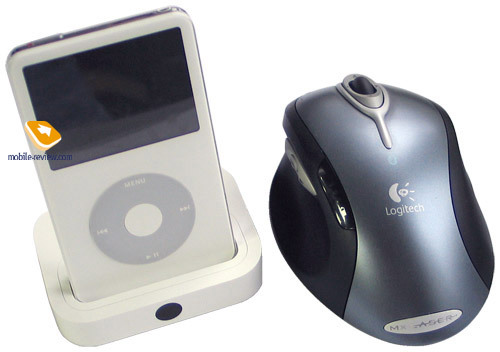 It is quite standard for Apple, as it comes bundled with notebooks of this company and iPod Hi-Fi. The remote utilizes a tiny battery as the power source, which makes for Nano-esque casing’s thickness. The remote houses navigation ring lifted directly from iPod Shuffle – a circle where pressing one of the four directions you can adjust volume, switch tracks, while in the centre is the Play/Pause button. 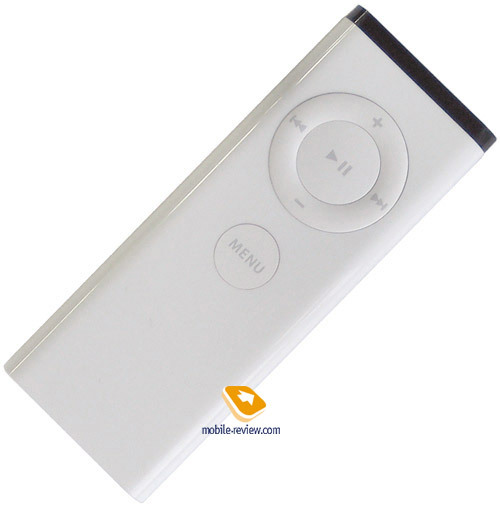 It also plays host to the Menu button, allowing you to manage all iPod’s functionality from distance. The action radius for the remote is more than 10 meters, which is quite good. The build quality was never an issue with the remote, nor it was with any of Apple-branded products – all details are well-attuned, no gaps at all. The next item on the list is the cradle. Similarly to the remote it is made of white plastic. The squatty casing of the Dock is deliberately made heavier so as to get a bitter grip on horizontal surfaces, but rubber layer on the bottom serves exactly for the same purposes. Combined, they let you forget about worrying that iPod will slip or fall on one of the sides, if only the cradle is not installed on the carpet in front of the telly. 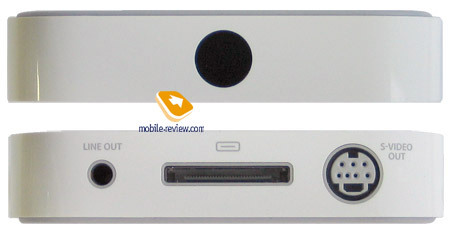 The dock comes armed with a proprietary socket, mounted on the top panel. The fascia houses a round window or Infrared receiver, where you should aim with the remote. The bottom plate, as well as the sides, is left completely bald. Now, the rear houses a whole army of sockets, to be more precise three of them: AV out, standard iPod socket for the default cable and S-Video composite out. The AV employs mini-jack design and features an additional pin for video output. 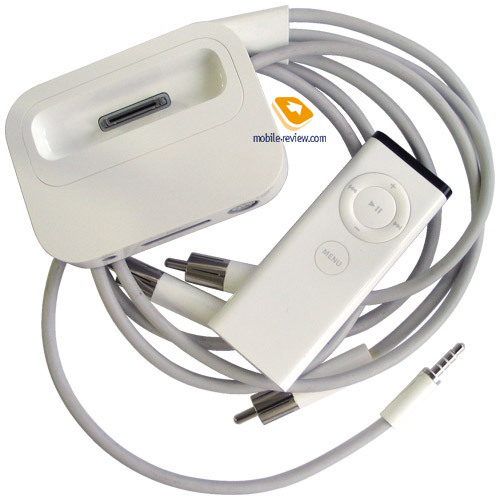 Not all users suspect that fact, but the 5G iPod is equipped with the same socket, so that should you need to get the picture onto the TV, all you will need is the cable, so it’s possible to do without cradles, that are here only for the convenience’s sake. Universal Dock serves for remote management, which comes in handy when watching movies of lengthy photo albums. Apart from that, using the Dock you can charge your iPod or connect it to PC. 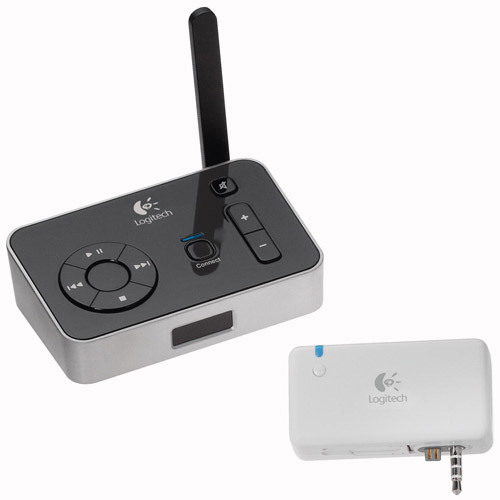 Also it supports composite signal output, but for that you’ll have to purchase a special cable, which is luckily a standard unit found in just about any audio-video shop around. 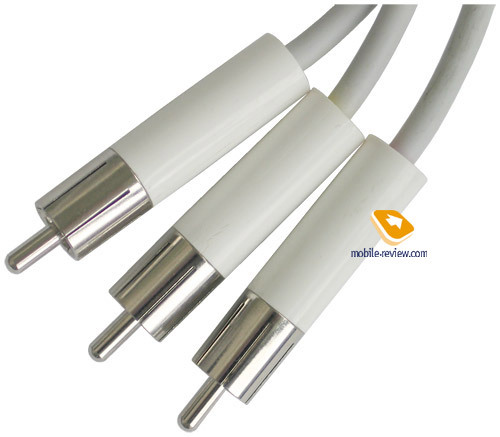 The cable you get out of the box has three-pin mini-jack on one side and on the other one – three RCA sockets, mounted on a convenient plastic T-branch 20 cm away from the end. The cable’s thickness is quite something, as it lends the cable a very solid feel. Third-party manufacturers of cables for iPod claim that their products are the best quality-wise, but such delicate aspects as distortions cable brings about can be measured only via very sensitive special devices, let alone evaluating it by sight. The cables are marked in standard colors (yellow for video, white and red for audio), at that the color coating is applied to the internal ring, while outside all jacks are finished in the trademark white. And the last, but not the least, the power adaptor, which is nothing to shout about – it’s a standard charger by Apple: white plastic casing, about 4 mm thick with the apple on its side and a USB socket on the back. Regrettably there is only one socket on the adaptor, thus charging the player and linking it up with PC is impossible, you’ll have to choose either of them (or buy another cradle if you love your iPod so much). All constituents of the kit match each other both design- and abilities-wise, so that the very concept of the kit doesn’t seem made-up. Impressions and thoughts on possible areas of application – coming up in the next paragraph. When taking the kit’s constituents out of the box, you can’t get rid of the feeling that the cradle will surely be very fitting for your TV, but at the same moment you get to realize that to place the Universal Dock next to the telly another USB data cable for iPod is required – one cable will link it up with the power network and the other will be used for connection with PC, though it is impossible to do that at the same time, hypothetically nothing hampers in implementing such feature. By the way, this cable costs more than 20 USD in Russia. While hooking up the Dock with the power network and TV you find out another disappointing aspect: length of loose ends of the cable isn’t enough to properly link up the video cable with TV and audio cables – with a receiver or directly with the audio system. 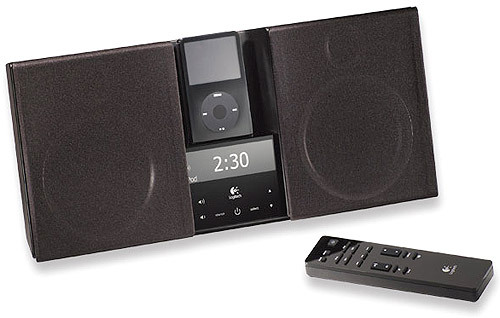 Thus for watching video or slide-shows via iPod you’ll have to rely solely on the TV speakers, which are not particularly powerful and penetrating in most cases. However, one the player has been successfully connected, the picture quality gives a pleasant surprise. On CRT-TVs the image looks better due to linear rendering. What really made me wonder was the fact that even re-compressed Internet-trailers of Hollywood movies seemed to be OK quality-wise, not to mention video clips. It is quite natural, though, that on a big screen video is much more eye-candy, but the combination of iPod and AV Connection Kit has exceeded pretty much skeptical expectations of mine, which counts for something, to tell the truth. On LCD-TVs I spotted pixelization of the picture and video artifacts, but this isn’t much of a problem. There is nothing special about charging the battery or managing playback remotely, so we moving right into conclusion part. Operation of the kit on whole, as well as it particular constituents, deserves some warm words and doesn’t allow us to have any reasons for complaint. Though there are two niggles with it. First, it is tailored to working with TV (this can be solved by buying a third-party cable, but what’s the point of this kit then). Second – inability to use the cradle for charging the battery, data synchronization and connection with TV simultaneously. In this we can clearly see the intention of large manufacturers not to release “do-it-all” devices – segmentation is most welcome for their business. Back on the plus side, here all the rest impressions of the kit – a very adequate picture for both CRT- and LCD-TVs, good build quality, presence of some parts that cost more as stand-alone units. The price for Apple AV Connection Kit in the US is 100 USD, and in Russia retailers strive to add 25-30 USD to that. Purchasing the kit, as I see it, will be justified for those having literally tons of video clips stored on iPod or using the player as a vault for photos. The convenience of watching and demonstrating photo/video via this kit is unquestionable and worth this sum of money for sure. 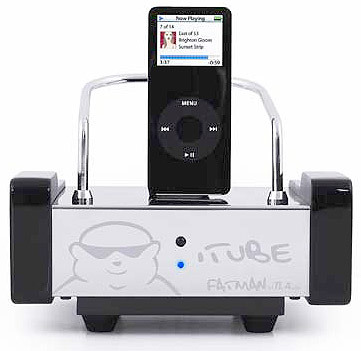 However if you plan on turning to its capabilities from time to time, then it might be a bit too pricey, but even in this form it can be a good gift to any iPod aficionado.